This web template has been designed for your own football club. You can upload your own pictures and change the design to make it match with your team colours. To get you started, we have created a football logo for you, but you can add your own soccer team crest or club badge and change the design to suit your needs. Notice how your new website also includes a helpful selection of menu button options. Plus, it is quick and easy for you to add, remove or rename the menu options, according to your needs. If you wish to sell season tickets, sports merchandise and football products, this web template can rapidly put you on the fast track. Using a free PayPal shopping cart, you can sell your products on the internet using this template design. 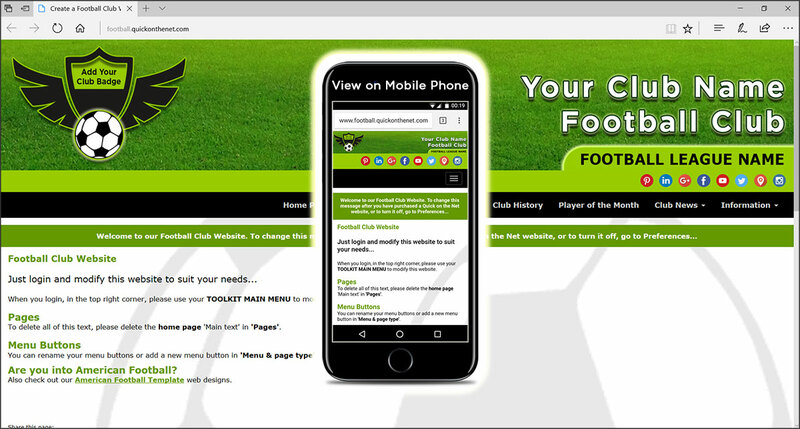 For more details on our web template service for football clubs, visit QuickontheNet.com and discover how to create a football club website.